SAN FRANCISCO, California, Sep 28, 2010 (IPS) -- A week after Iranian President Mahmoud Ahmadinejad told heads of state gathered for the U.N. General Assembly in New York that his government does not jail its citizens for expressing their opinions, Iran's Revolutionary Court sentenced Hossein Derakhshan, an internationally known Iranian-Canadian blogger, to 19 and a half years in prison. 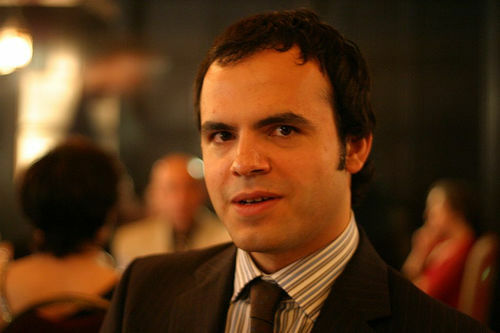 Arrested in October 2008, Derakhshan had been charged with "cooperation with hostile states" and "propagating against the regime," among other counts, the site said. In addition to the lengthy prison term, he was fined and banned from membership in political parties and work in the media for a period of five years. "We are shocked," one of Derakhshan's relatives told IPS on condition of anonymity due to the sensitivity of the case and fears of a backlash by security forces. "We never expected this to happen. Even according to Iranian laws, he has not done anything to deserve such a harsh sentence." Neither the family nor Derakhshan's lawyer was aware of the sentence until it appeared on Mashreq's website. His relative told IPS that Derakhshan did say that after two years in prison, "My state of uncertainty has finally ended," referring to his long detention without any progress in his case. Mohammad Ali Mahdavi, Derakhshan's lawyer, told IPS that the verdict still has not been announced even to him. "I'm waiting for the official announcement to start working on the defence bill for the appeals court," he said, adding, "I prefer to defend my client rather than bringing the case to the media as it might endanger the fate of the case at this phase." Judge Abolqasem Salavati is amongst three judges who are well-known for issuing long and harsh sentences for political prisoners, particularly the post-election detainees. His rulings have included the death sentence and numerous long-term prison sentences. "I believe that first of all, the charges are totally unfounded, and the verdict demonstrates the injustice that many people have been talking about all these years," Nikahang Kowsar, an award-winning Iranian cartoonist and blogger based in Toronto, where Derakhshan used to live, told IPS. "Hossein wasn't a very nice guy to many of us," Kowsar said. "He criticized many journalists, bloggers and activists for being critical of the Iranian regime and ridiculing Iran's leaders. He called us 'agents of neo-liberalism' or 'enemies of Iran' and tried to portray us as the ones willing to sell our nation to the West, but he was absolutely entitled to express his mind." Derakhshan, also known as Hoder, has been dubbed Iran's "Blogfather" for his role in promoting blogging among Iranians via his popular website, hoder.com. In 2006, Derakhshan traveled to Israel as a Canadian citizen, a trip that caused a huge controversy in Iran and abroad, as Iranian law forbids Iranian citizens from traveling to Israel. "We have a saying in Iran: 'There is freedom of speech in Iran, but there is no freedom after speech in Iran,'" said Kowsar. "His captors are willing to make an example of him for others," he added. After years of criticizing the Iranian government, a few years ago Derakhshan started supporting Ahmadinejad. He launched a fierce attack against the government's critics, including human rights activists, politicians, and journalists. A source close to Derakhshan told IPS that his friends and colleagues warned him that traveling to Iran could be dangerous for him. "But he was positive that his support for Ahmadinejad and his government would protect him from being arrested," said the source. "Hossein had had some conversations with Press TV about working in their Tehran office," Derakhshan's mother, Ozra Kiarashpour, told the Kamtarin website on why he decided to come to Iran. "Before his return to Iran, the High Council of Iranian Affairs Abroad promised Hossein that his trip would be without problems," she said. "He had cleared his trip with this Council, which is governmental and which is in contact with the intelligence service. That's why even though Hossein knew that they would call him to be questioned, he did not expect to be arrested like this and hadn't told us what to do in case he was arrested." "A representative from the Council told us that they pursued his case on behalf of the Council but that unfortunately they couldn't do anything further. Why are there such splits in the country's security apparatus?" she asked. Mohammad Mostafie, a human rights lawyer who recently fled to Norway under pressure from the Iranian judiciary, told IPS that, "Several judges have gathered in a place they call the Revolutionary Courts, where they issue unfair, illegal, and inhumane rulings based on orders from security and intelligence forces." "Some of these judges, like Judge Salavati, obey the intelligence forces rather than the law and issue whatever they want, whether it's a longtime prison sentence or a death sentence," he said.